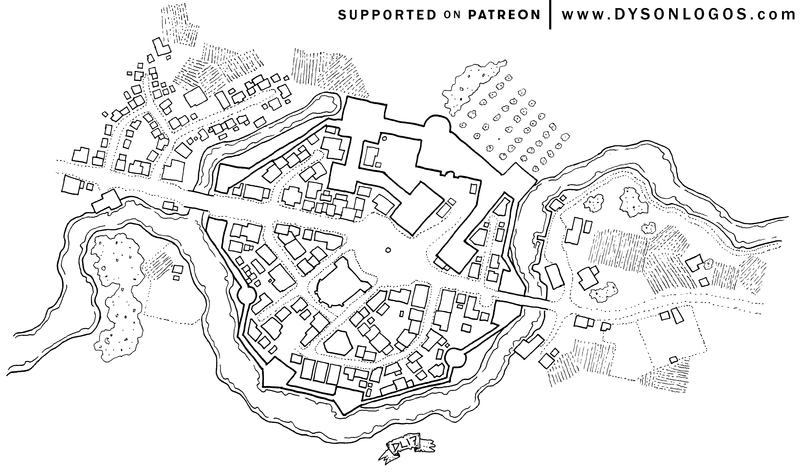 It is the end of the month and time to head back into the older maps and dig up a few to re-release under the free commercial license, all thanks to the awesome patrons who support my cartographic wanderings via Patreon. Here we are bringing back Tever’s Fort – an urban map I originally released in October of last year. The fortifications of Tever’s Fort were erected quite recently along the Dragonfly Channel and local farmers and tradesmen quickly moved into and around the fort. The region south of the Dragonfly are wild and dangerous lands officially under the massive land claims of the Satrapy, but uncontested, unmonitored, and unprotected. Erozel Tever built the fortification as she retired from adventuring. A woman of late middle age, she’s still skilled with the blade, but spends more of her time maintaining the household than adventuring. Her goal was to pacify the lands south of the Dragonfly, but underestimated the amount of time required to build and maintain the fort that bears her name. Now she only sends out teams to deal with incursions and immediate threats instead of proactively working to pacify the region. The main fortress on the north side of the enclave houses Tever, her family, and her military forces. Opposite the fortress is the church of the Binder who “help” maintain order within the town, providing help to worshipers and keeping an eye on everyone else.